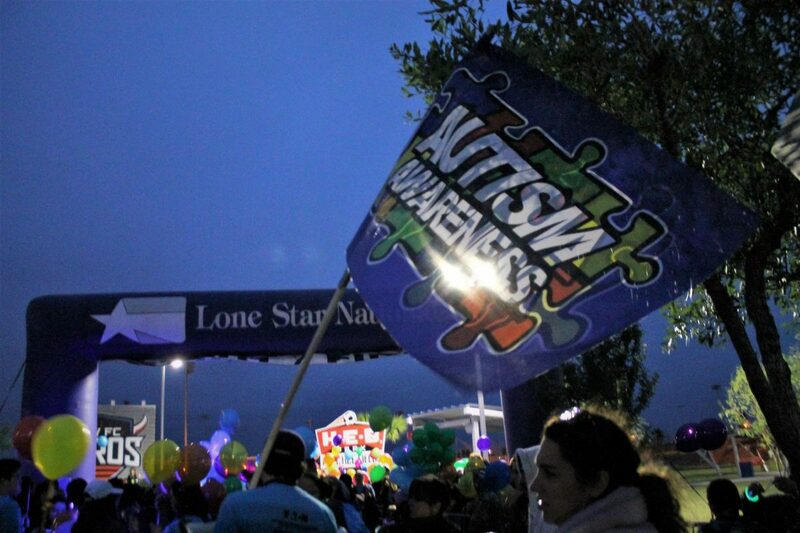 A blue flag with puzzle pieces is seen bearing the words "Autism Awareness" before the Buddy Walk on April 7, 2018, at H-E-B Park in Edinburg. EDINBURG — April is National Autism Awareness Month and for Melinda Moreno, it is a time she knows all too well. Moreno, founder of Team Mario saw her life change in a matter of days when her son was diagnosed with autism. Moreno’s son was severely affected by autism, which can range in severity from mild to severe. Mario lost all verbal and nonverbal communication. The family eventually found out about Applied Behavior Analysis, a program for children to re-learn their skills and behavior such as academics, social skills, communication and adaptive living skills. The organization, founded in 2014, was started to spread awareness about autism and those individuals with the disorder. “In 2007 there were no ABA services, so we had to seek outside the state,” Moreno said. She traveled to New York to get help and training to put together an ABA program in South Texas. “They helped me gain all his skills back, gain his ability to communicate and doing so we wanted to share that with other families and be able to help our community and so we started this organization,” she said. After Mario’s diagnosis, Christine Clifford entered the family’s life as an in-house therapist to re-teach Mario using the skills of ABA program. Clifford, who is a special education teacher, has worked with Mario since he was an adolescent and has seen him grow. Clifford is one of the event organizers for Team Mario’s Autism Awareness and is the marketing director for Team Mario. On April 7, Team Mario held “Light Up The Night,” an autism event at H-E-B Park, which will be one of several events throughout the month to draw awareness to the disorder. As a way to make the event larger, Team Mario collaborated with the Edinburg school district to bring families together and bring community members to support autism. “Mario is now 13 years old and was the inspiration for the organization, but it’s the families that we meet on a daily basis that we work with and inspire Team Mario to make more opportunities and more inclusion,” Moreno said. The community event had a Star Wars theme and included an autism fair organized by the school districts with rides, a Star Wars Jedi Academy and face painting in addition to the 5K run/walk and Buddy Fun Walk around the park. Team Mario will hold more awareness events throughout the month, including the PSJA Autism Walk at PSJA Stadium on April 14 and the Autism Awareness Bash at Mission CISD on Thursday, April 19. To learn more on Team Mario, visit, www.teammario.org or visit their Facebook page of the same name.